Pruning Promotes the Health of Your Trees and Supports Your Landscaping Design. Most homeowners will tell you that pruning is never truly done, and they’re right. Tree pruning is hard work. 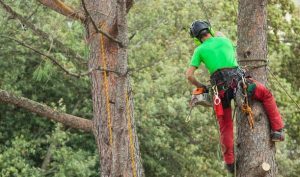 While it may be tempting to indefinitely postpone maintenance, tree pruning provides three very simple, but critical benefits for your property. Perhaps the most important mission behind tree pruning is protecting your home from damage. For tree limbs that hover directly above your house, catastrophic damage is never to far away. That’s why homeowners need to consistently keep their trees trimmed and pruned, so the next thunderstorm won’t leave fallen limbs on your rooftop. As a side benefit, this will also reduce the volume of twigs and leaves that flow onto your roof or into your gutters. Who wouldn’t like to clean their rooftop less often? Dying limbs draw nutrients away from healthy areas of your trees. Pruning away these limbs allows your trees to utilize its resources more efficiently and grow new limbs in the process. If your trees can’t seem to continue growth, try scheduling a tree pruning. How many times have you driven through a neighborhood and spotted out of control tree growth. Overgrown trees detract from the beauty of your landscaping and can even affect your property value. If you think managing this wild foliage might be too big a project for you, reach out to a trustworthy landscaping service to help you get the job done. If you’d like more information on landscaping, or if you’d like to schedule a tree pruning for your property, feel free to talk to one of our specialists at MDM Landscapes. Talk with us at 817-396-0125. Posted in Uncategorized on May 14, 2018 at 6:03 pm by MDM Landscapes.